In report after report this blogger has been hearing about how the recent problems with Fannie Mae and Freddy Mac are dreadful, simply dreadful, because there has been “privatization of gain and a socialization of loss.” Visions of fat cats making out like bandits while the poor taxpayer is stuck with any and all loss dance through the air. Well, maybe not. 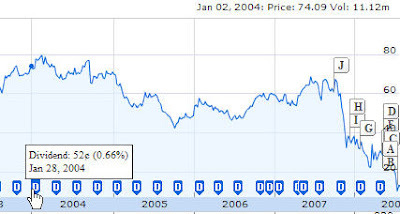 Consider the fat cat who purchased one hundred thousand shares of FNM on January 1st, 2005 at $71.21 a share. Cost $7.121 million (ignoring any commission costs). The aforementioned fat cat holds his shares until today, July 24th, 2008. In that time period FNM pays dividends sixteen times, said dividends ranging from 10 cents to 50 cents a share, for a grand total of $482,000 in dividends. At close of day July 24th FNM is worth $12.02 per share and the fat cat has lost over $6.4 million ($7.121 million + $482,000 - $1.202 = $6.401 million). As he sorrowfully sits by the radio, he hears with bemusement how Fannie Mae has privatized gain and socialized loss.